Egypt’s President Abdel Fattah al- Sisi said Tuesday that he won’t interfere in the judicial verdicts, state Nile TV reported, dashing expectations of presidential clemency or presidential pardons. His statement came one day after an Egyptian court on Monday convicted three journalists from Al-Jazeera English and sentenced them to seven years in prison each on terrorism-related charges, bringing widespread criticism that the verdict was a blow to freedom of expression. 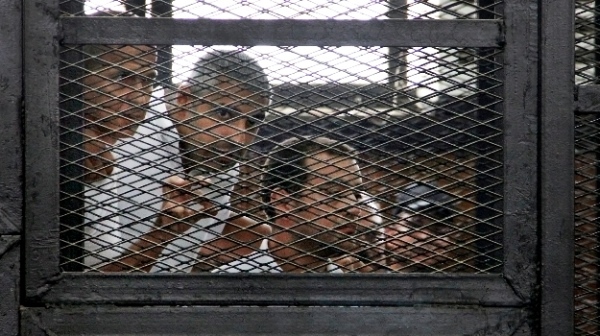 The three, Greste, Fahmy and Mohammed, have been detained since December charged with supporting the Muslim Brotherhood, which has been declared a terrorist organization, and of fabricating footage to undermine Egypt’s national security and make it appear the country was facing civil war. “We must respect judicial rulings and not criticize them, even if others do not understand this,” Sisi said. An Egyptian court sentenced on Monday three journalists of Qatar-based Al Jazeera TV English, including Australian Peter Greste and Egyptian-Canadian Mohamed Fahmy, to seven years in prison. The third defendant Egyptian producer Baher Mohamed was handed additional three years term over other charges. Australian Prime Minister Tony Abbott expressed “shock” and “dismay” over the sentencing. “It is important that there be due process, it is important that decisions be made on a fair and just basis, so we will be talking to the Greste family, we will be talking to the Egyptian government about what we can do to try to ensure that Peter Greste comes home as quickly as possible,” said Abbott. Abbott had said earlier he had a “very constructive discussion” on the weekend with Egyptian President on the issue. Meanwhile the Egyptian judge also handed 10-year jail terms to two British journalists and a Dutch one, who were not in Egypt but were tried in absentia. They were arrested in late December last year in a sweeping crackdown on supporters of former Islamist President Mohamed Morsi who was ousted by the military in early July last year after nationwide protests erupted against his one-year rule. Britain and Australia summoned the Egyptian Ambassadors to make official objections to the ruling.